Despite these early difficulties, my family settled well in Milwaukee where there were many other Germans. It gave them comfort to be in a place with many familiar German traditions. Joseph, always interested in music and drama, joined the Karnival German social/musical organization shortly after his arrival. Three more sons were born: Guenther in 1924, Paul in 1926 and Walter in 1927, all American citizens by virtue of their birth in the US. 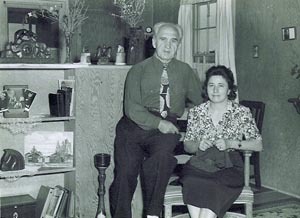 Like most women during those days, Francis never worked outside the home and relied solely on her husband for support. She had her hands full trying to raise 4 boys. We went to school in Milwaukee and thought of ourselves as Americans. We lived in a rented house in Milwaukee. Neither Siegfried, nor my parents became American citizens during those years. Everyone was working so hard raising a family; perhaps they didn’t have time to go to school to become citizens. Who would have ever predicted what would happen to my family because of that mistake? Citizenship papers or not, my parents thought of themselves as Americans right from the beginning. 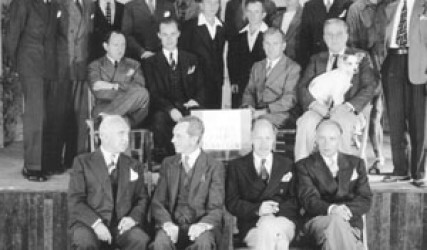 But they also loved the culture and traditions they were raised with and sought out the company of other German Americans by joining various German social organizations in Milwaukee. 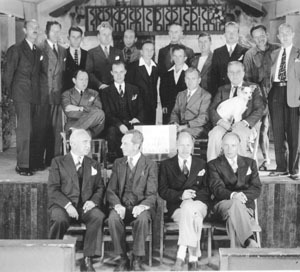 As the years passed, my father became more and more involved with such organizations, particularly those with connections to the arts. He never had political inclinations. Like so many German aliens in this country at that time, he had left Germany long before Hitler’s rise to power. He knew no more of him than any other American and cared little for him. Like all immigrants, though, he did love the culture of his homeland. 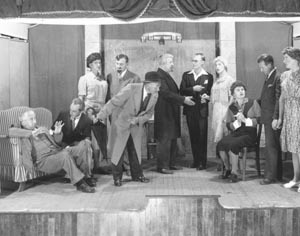 He was an active participant in and director of musical and dramatic productions. He was popular and well known in the area. He even wrote plays. My mother was busy raising her 4 active boys. 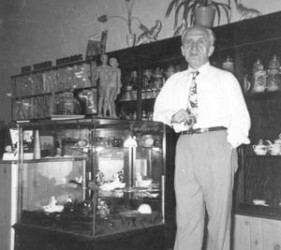 By December 1941, Siegfried had graduated from high school, was working, but lived at home. The other 3 boys were still in school. I was an honor student and lettered as a gymnast. My family life was like that of any other American family and we thought of ourselves as Americans. Despite our beliefs, others, who considered themselves “true Americans,” did not consider us Americans. Where were our parents’ citizenship papers? Why hadn’t they become citizens after all this time? Our German ancestry, Dad’s job as a chemist and family activities with German clubs probably made us suspect. We have never known why the FBI became interested in us, but that interest caused immeasurable pain in our lives. The details of my father’s arrest and subsequent internment are difficult to recall because they occurred 60 years ago. His arrest initiated a 6-year period of great turmoil for my family and for my mother, especially. She was never the same afterwards. The FBI took my father from our home on the night of Dec. 9, 1941 about 3 in the morning. Everyone in the house was asleep when the FBI agents pounded on our door. My father went to the door, half-asleep. The FBI agents demanded that he come with them. He was not allowed to bring anything. My mother was horrified and begged them not to him. That was the last we knew of Dad for 6 weeks. The FBI took him away and he never returned home. We had absolutely no idea why or where he was taken. Without Dad, we had no source of income. My mother did the best she could, but eventually applied for welfare. She was told that she had 4 boys at home and they could work. She got no aid whatsoever and we boys worked nights, doing the best we could at school during the day. I was a senior in high school. I worked the 4-11 night shift at a local sausage house. My younger brothers helped as much as they could. Luckily, two men came to our aid. After begging him for help, my mother got my Dad’s boss to at least give us his Christmas bonus while he was interned. Another kind man gave us money sometimes, so we could keep our home. I have never known his real name, but we owe him our gratitude. My grades went down immediately, not just because of my work, but because of the emotional upheaval. Eventually, I was met with the principal of the school and he helped me so I could graduate. My brother, Paul dropped out of school and worked at Coca-Cola. Mother was very industrious. She cleaned houses, made aprons for sale and even did home canning, up to three hundred jars of fruits and vegetables at a time. After one trip to the farmers’ market, my youngest brother, Walter, and Mother could tell immediately the house was ransacked. You could easily unlock the rear door and enter through the milk chute. Another day, a newspaper reporter showed up at the back door and forced his way in. My mother got rid of him using a broom. She was always a sensitive woman and suffered greatly during this period. I was nervous about Dad, but equally frightened because the FBI had taken many people away in the middle of the night right after Pearl Harbor. The Milwaukee news media covered everything and helped add to the hysteria. Naturalized citizens who were German-born were even fired from their jobs. Naturally, our community knew that Dad had been taken away and everyone was suspicious of us. Going back to school was really difficult. Few of our friends wanted to have contact with us. One girl refused to go out with Walter because she “didn’t go out with Nazis.” A good family friend parked a block away when he came to visit. We even felt like outcasts at our own church because of our German blood. Many were afraid of associating with us because it might mean they, too, would become suspects of the FBI. Fear ran rampant. That is what happens when people are snatched from their homes. We searched desperately for my father as the weeks wore on. My older brother, Siegfried, made numerous attempts via letters, as well as local inquiries, trying to find him. Rumors flew and he tried to trace every one. No one would help us. Incredibly, after a month and a half we located him right in north Milwaukee at the Milwaukee Municipal Barracks. He had not even been allowed to tell his family where he was! Once we found my father, we were permitted to visit him for short periods of time on certain days. There were about 50 men with him. In fact, there was a bus that went up to the barracks once a week with all the wives so they could visit their husbands. The conditions, while livable, were not good. Physical exercise was nonexistent and time dragged. 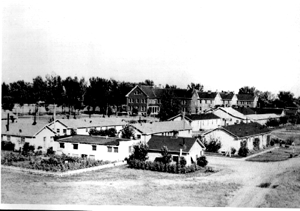 Eventually, Dad’s internment was ordered and he was sent to Fort Oglethorpe in Georgia, then to Camp Forrest in Tullahoma, Tennessee. He ended up in the large Fort Lincoln internment camp for adult males outside Bismarck, North Dakota. Life went on for my father and for us. My mother continued cleaning houses. 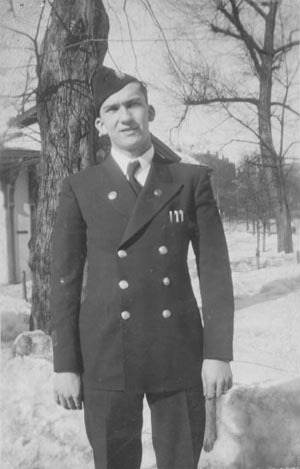 Paul joined the armed services as a Merchant Marine in 1943, despite Dad’s internment. I enrolled in the University of Wisconsin Extension Division in Milwaukee. I went to school fulltime and worked the 11 pm to 6 am shift at Lakeside Labs helping with production. When I could, I napped on the catwalks in the lab. The boss would let us sleep periodically and 20″ before quitting time, he’d wake us up to leave. I tried my best to keep up my grades. Walter graduated from high school and joined the Merchant Marine. He completed his basic training at Sheepshead Bay, New York in September 1944. He then was accepted at the Cadet Radio Officer Training School on Gallups Island in Boston. Meanwhile, at Ft. Lincoln, Dad immediately started providing entertainment to the hundreds of other internees. 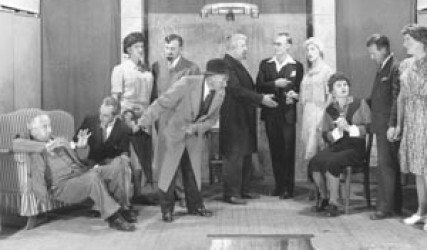 He wrote plays, directed productions and generally made life a little easier for his fellow internees, as well as for himself. My mother and we boys each visited him once. The visits extremely difficult given the distances involved. Visits were very short, strained and always conducted under guard. In December 1944, after Dad had already been interned for 3 years, we (Mother, Siegfried and I) were notified we were being deported to Germany with my father. I was horrified. Why would we ever go back to Germany? It was blown to bits and besides, I was an American, not German! We tried unsuccessfully to let Walter and Paul know we were leaving. 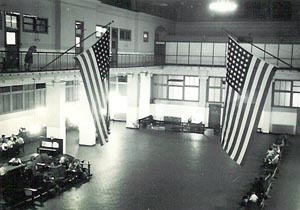 We left Milwaukee on January 1,1945 for Ellis Island via train. We had little or no time to prepare for our departure. We were only permitted to take along several boxes measuring 2’x 2′ x 4′. We left behind most of our belongings, furnishings, clothes and irreplaceable family memorabilia. Upon arrival at Grand Central Station, we tried again to contact Walter and Paul. We finally reached Walter on Gallups Island. We reported to Ellis Island a couple of days before the S. S. Gripsholm was to depart for Germany with its human cargo, most of who were slated for exchange. 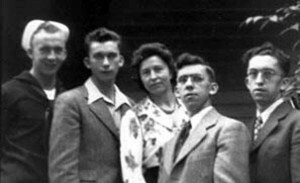 The repatriation was part of an America-Germany exchange program in which civilians from this country were exchanged for Americans held in Germany. My father was nowhere to be seen. Were we being sent back without him? We had no idea how we would survive. Ellis Island was filled with people and emotion. Siegfried and I were assigned cots in the Old Record Room, the huge hall in which immigrants were processed years earlier. Men were crammed in everywhere. My mother was assigned a cot in the women’s area. 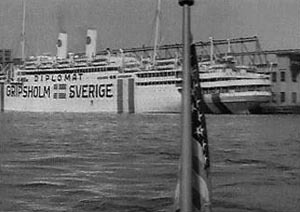 On January 6, 1945, at least a thousand people were loaded onto the Gripsholm to cross the northern Atlantic at the height of the war. By this time, I was so numb I hardly remember what happened. The military oversaw the transport of hundreds to the ship via Coast Guard cutter. Women and the children were in the cabin, but the men and older boys were outside on the rear deck. When we left, it was a very snowy, freezing cold night. My mother was a nervous wreck. Where was my father? Upon reaching the Gripsholm, the Greis family was told to stay on board. We stood outside on the rear deck bobbing up and down in the water, waiting. Finally, someone told the captain of the cutter to bring us back to Ellis Island. All of our belongings, those we had carefully selected from untold items left behind in Milwaukee, went on to Europe. We had nothing but the clothes on our backs and what we carried with us onto the cutter for the trip to Germany. We never got our other belongings back. The following morning, we were ecstatic to be reunited with my father who had come from Fort Lincoln. My mother was clearly suffering under the strain of the situation. The conditions at Ellis Island were tense and difficult. Unsuccessfully, we continued trying to contact Paul on his merchant ship through the Red Cross. We were pretty sure his ship was in a war zone and we were all very worried about him. During the following weeks, Siegfried and I were interrogated extensively by government authorities. My mother was very upset about it and demanded to sit in as a witness. The intense questioning stopped finally. Whether it was my mother’s efforts or because it became clear that we didn’t know anything, I don’t know. We were happy when they left us alone. Thankfully, Walter was finally able to visit us on Ellis Island. He still has trouble describing how he felt when he learned that the government he and Paul were serving was deporting his family. As soon as he got his first weekend pass, a teenager proudly dressed in full cadet officer’s uniform, he took the train to New York to visit us imprisoned at Ellis Island. During the entire trip, he wondered how people would react when he arrived in full uniform at Ellis Island and told them that he was there to visit his family. As he suspected, his visit created quite a stir. 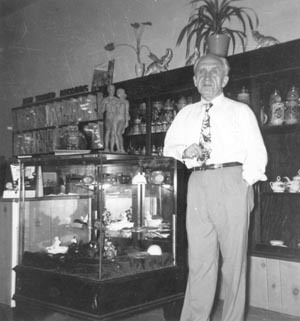 Walter made several trips from Boston to New York to visit. It was not easy. His funds were limited and his time short due to his studies. During that time, an FBI agent visited him. He believes he came up from New York. He was shocked and remembers asking him, “What do you want of me, a 17-year-old cadet?” The agent did not answer his questions. Shortly thereafter, without warning or a complete explanation, Walter was stripped of his cadet uniform, and relieved from the training school at Gallups Island. His commander implied that because his family was interned, he was not allowed to become a commissioned officer in the US Armed Forces. He was mortified and upset. 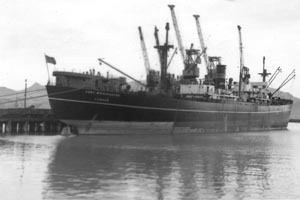 Immediately thereafter, he was ordered to return to Sheepshead Bay, where on April 5, 1945, he completed merchant vessel engine and boiler training. In a way, he views his transfer back to Sheepshead Bay as a blessing, because he could go to Ellis Island every weekend to visit us. After passing his examinations, Walter was granted a ten-day leave. He visited the family and returned to Milwaukee. This was a mistake. He was miserable. Our home was no longer ours and our belongings were gone. He was then transferred to Long Beach, California. From May through November 1945, he was assigned to ships in the Pacific War Zone in support of Admiral Halsey’s Third Fleet, spending time in the Philippines. Both ships, the SS Fort Niagara and the SS Edward Nickels played integral roles in the Pacific War Zone of Operation. It was anticipated that the Nickels’ final mission in the Pacific War Zone would be part of elaborate plans for the Allied Invasion of the Japanese home islands pursuant to two massive military undertakings. Still on Ellis Island, my parents lived in an area for married couples. We were able to visit them. Siegfried and I stayed in Old Record Room with hundreds of other men. I remember Italians at Ellis Island, as well as German Latin Americans, including a man who had been in the coffee business in the cot next to me. We had no privacy whatsoever. I was happy to find a job in the officers’ mess because there wasn’t much to do. The only physical activity possible was a brief walk in a fenced exercise area near where the ferry docked. Once we saw a boatload of people delivered. The tide was low and the military personnel heaved the luggage up onto the shore. Some of the suitcases burst open to reveal their contents, including fine musical instruments. Little care was taken with anyone’s personal belongings. After years of being our family’s strength, my mother had a nervous breakdown. Everything finally got to her. She was transferred from Ellis Island to a Navy hospital where she stayed for several weeks. We were very worried about her, but not surprised at her collapse. It was predictable considering what she had been through. . She was not the only woman to suffer in this way. Mothers were under incredible stress. My father felt very guilty about what happened to us. He blamed himself, but he could never figure out what he had done wrong. Germany surrendered in May 1945, shortly after we arrived in Crystal City. We thought we would all be released, but only Siegfried was. He requested release shortly after our arrival. After some deliberation, the authorities agreed to release him. He happily returned to Milwaukee to work. I think he was merely paroled and was still subject to many restrictions on property ownership and travel. Happily, Paul returned safely to Milwaukee after having being stationed in the Indian Ocean with Merchant Marine for most of the war. Walter also returned to Milwaukee briefly and worked. They would not release my parents and me. In camp, I tried to get work in the lab hospital, but had no luck. I did work in the community dining room, and later, on a milk route. My mother’s health was never good. I recall that during my stay at Crystal City there were about 800 Germans and 1000 Japanese incarcerated. All the Japanese were released in 1946, but at least 500 Germans remained imprisoned at Crystal City. None of us could understand why we weren’t released. We learned that President Truman had decided that whoever was interned at the end of the war must be dangerous. He said that if we were deemed dangerous enough to intern before the war, we still were. That rule seemed to apply to mostly Germans. Finally, in 1947, 2 years after the end of the war, my parents were allowed to leave Crystal City and come home to Milwaukee. It was very difficult to start over again. They had little or no money and felt stigmatized by their internment. My mother was never the same after her ordeal. Eventually, we managed to rent a small flat until we could get organized. My father had a hard time finding a job doing anything but menial labor. He was refused reemployment at his old job as a chemist. My father never quit. I have to admire his stamina and determination after all he had been through. 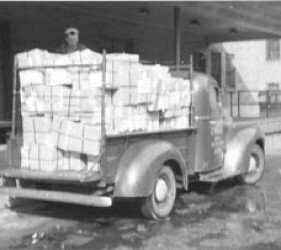 He borrowed some money and opened the “European Relief Store” which provided care packages for those suffering in Europe after the war. At night, we helped him pack boxes. 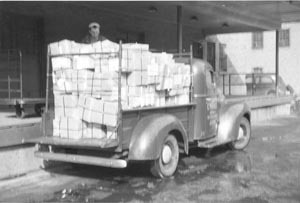 He sent up to 200 packages per day. 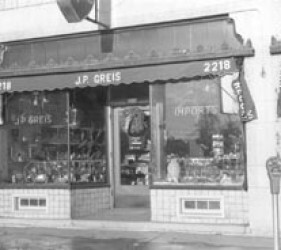 This store eventually grew to become J.P. Greis Imports. 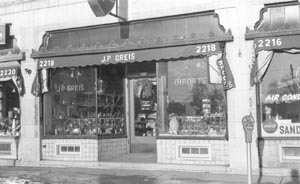 In 1948, the Greis brothers bought a chemical business. I left college without graduating to help with the business which Walter and I own to this day. Many years have passed since these events. Our mother died in 2002. She was 105. We wished that the government had admitted what it did during her lifetime. She lived to be very old, but it was not long enough. We speak out now because as we grow older, we realize how important it is for future generations that Americans know what occurred during the war to persons of “enemy” ethnicity. It is hard to imagine such things happening again, but they could. The laws that authorized these actions still exist. We feel the government must acknowledge the whole story. Although much is known about relocation from the West Coast, virtually nothing is known about the destructive forces of internment on families and communities. Paul and Walter gave years of their lives protecting our valuable, but fragile, liberty. All Americans must know the dreadful consequences of liberty lost, so they can ensure that it does not happen again.